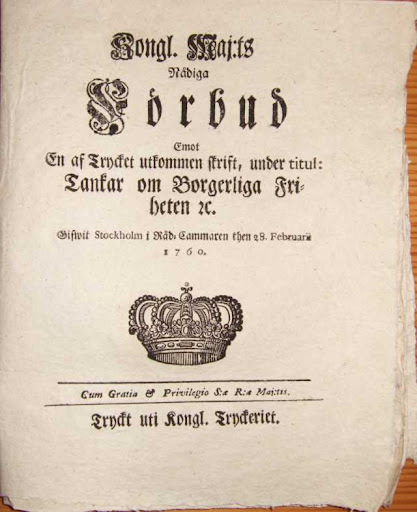 Forsskål's Thoughts on Civil Liberty (Tankar om borgerliga friheten) was printed in Stockholm on 23 November 1759 in a version which Forsskål had modified in consultation with the official censor Oelreich. On the very day of publication, the Kanslikollegium met and decided to ban the book. The Rector of the University of Uppsala, Forsskål's former teacher Linnaeus (Carl von Linné), was instructed to gather in all copies. Of the 500 copies printed, only 79 could be found and destroyed. In February 1760 an official ban on the publication of the work was promulgated. Its title page is reproduced below (no. 2). We list surviving copies of the first and second editions. If you know of the existence of other copies, we should be pleased to be able to add them to this list. Stockholm: tryckt hos directeuren Lars Salvius, 1759. 4°: [1–3] 4–8 p.; 4 leaves, signed )(2, )(3.
on )(8v 'GUD den Allrahögsta, som wårdar menniskjors sällhet, föröke | wår Swenska Frihet, och beware den til | ewärdeliga tider! | [group of type ornaments]'. Kongl. Maj:ts Nådiga Förbud emot en af trycket utkommen skrift, under titul: Tankar om borgerliga friheten &c. Gifwit Stockholm i Råd-Cammaren then 28. Februarii 1760. [Stockholm] : Tryckt uti Kongl. Tryckeriet, . 4 pages: 4°. Tankar om borgerliga friheten, i anledning af den nu så allmänt omtalade frihets-principen hos fransoserna. Stockholm: Tryckt hos Johan A. Carlbohm, 1792. 12 pages: 8°. Gunilla Jonsson has prepared a chart showing the variants between Forsskål's original manuscript, the 1759 printed version (as modified by negotiation with the official Censor), and the posthumous edition published in 1792, together with a brief introductory essay.